HAMCLEAN-13SS is designed to remove oils ,greases and waxes from the metal surface by soaking the job in the chemical solution at 80 to 90°C.The chemical is specially suitable for iron , steel, zinc surfaces. Multi-purpose metal cleaner for light, medium, heavy oils, waxes and greases. The treatment time should be 10-15 minutes immersion at 80-90°C and 2-3 minutes in spray systems. The job to be cleaned is properly jigged and soaked in the bath for 10 to 15 min. The treatment time depends on the amount of oils, Greases or waxes present on the metal surface. The cleaning perfection is checked in the adjacent water bath. The metal surface is closely watched when the job is lifted from the water bath. 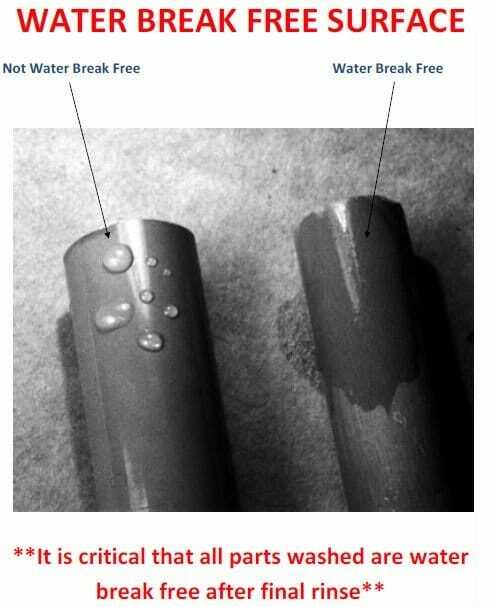 A continuous film of water on the metal surface indicates perfect cleaning, Whereas, the scattered water droplets on the metal surface indicates the presence Of oil traces which needs to be removed by further treating the job in the HAMCLEAN-13SS bath The incomplete cleaning only occurs when the oil or wax film is too thick on the metal surface or the treatment time is insufficient.